Book review #4 of 2013! Today's book review is for one of my favorite books of 2012. If you haven't seen my list of favorite reads of 2012, then you can find it here. Catherynne Valente's The Girl Who Circumnavigated Fairyland in a Ship of Her Own Making is a perfect example of why I love to browse bookstores at random. I found this book entirely on accident and was won over by the title (I know a lot of people get drawn in by covers, and I completely understand that, but I tend to get drawn in by titles more so than covers- though having a unique, aesthetically pleasing cover doesn't hurt.) Oh, and having a positive blurb by Neil Gaiman on the cover never hinders your chances either. "September is a girl who longs for adventure. When she is invited to Fairyland by a Green wind and a Leopard, well, of course she accepts. (Mightn't you?) But Fairyland is in turmoil, and it will take one twelve-year-old girl, a book-loving dragon, and a strange and almost human boy named Saturday to vanquish an evil Marquess and restore order." Growing up, I loved Alice in Wonderland (both the Disney film and Lewis Carroll's novel), as well as Peter Pan (again, both the Disney film and J.M. Barrie's novel). I always said that I thought one of the reasons why Miyazaki's Spirited Away became one of my favorite films is because, to me, it was like a Japanese version of Alice. As a kid, and even now as an "adult," there's always a deep yearning that some mythical creature will pick you up out of your dull life only to immerse you into something strange and beautiful. The Girl Who Circumnavigated Fairyland in a Ship of Her Own Making has a similar affect on me. The key to loving a novel such as this is loving the new, quirky world. You don't have to love it in the sense that you would relocate yourself there (i.e. : I would never actually want to move to Peter Pan's Neverland), but it has to spark this curiosity that makes you just want to jump into the novel and just start touching everything to see what it does. Fairyland, Valente's Neverland, did this for me. There were constantly new twists- new creatures, new rules, new storylines- that kept me from getting bored. The characters in this novel are charming. I liked September quite a lot. I found her to be, as most protagonists in these novels are, full of curiosity. I could definitely see character growth as the novel proceeded, making the realm of Fairyland all the more realistic. I think the language in this book is also beautiful. It reminds me a lot of Lewis Carroll and how he can write about such frivolous, fantastical topics but make it sound so elegant and artfully done. The language is what makes you feel like you're not reading a children's book (and I have nothing against children's books, just that as you get older the cheery, simple language that you find in illustrated books can lose some of it's magic). When I read, I am very drawn towards variation in sentences. It's not something I consciously look for, but language is something that I think can easily make or break or a novel without the reader even understanding why. I love this novel, which is obviously why it ended up on my list of Favorite Reads of 2012. I highly recommend it to those who enjoy Alice, Peter Pan, Narnia, etc. Last year I also read the sequel to this novel, The Girl Who Fell Beneath Fairyland and Led the Revels There. I loved that book even more. 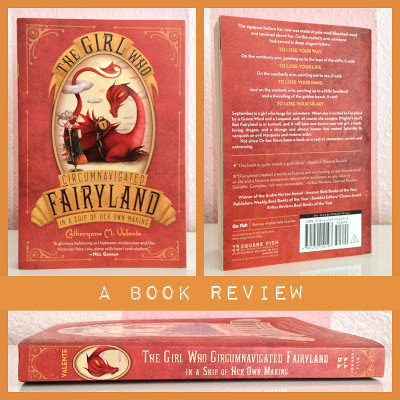 Also, Catherynne Valente did a short story, "The Girl Who Ruled Fairyland- For a little While" (that you can only find in an electronic format) that divulged the history of some of the characters you'll find in The Girl Who Circumnavigated Fairyland in a Ship of Her Own Making. So if you read this novel and enjoyed it, I would highly recommend you download it and read it as well.